This report focuses on the market for specialty chemicals in water management. The chemicals covered are grouped into three categories: ion exchange resins, organic polymers, and formulated products. The organic polymers included in this study are polyacrylamides, polyamines, and quaternary ammonium polymers, which are consumed as coagulants and flocculants. The formulated products are further broken down into corrosion inhibitors, scale inhibitors, biocides, and foam control agents. Ion exchange resins are used to change the ion composition and organoleptic properties of water. They have the characteristics of OEM chemicals rather than consumer chemicals. Styrene-divinylbenzene polymer is the most widely used ion exchange resin, followed by polymethacrylate and polyacrylate resins. Ion exchange resins are used in the demineralization of boiler feedwater, boiler condensate polishing, water softening, removal of organic impurities and heavy metal residues, and production of ultrapure water. Organic polymers are used to clarify water by aggregating and separating microscopic particles in water. Flocculants are used to dewater sludge. Formulated products are necessary to ensure the efficient operation of cooling and boiler systems in industrial and commercial processes. North America, particularly the United States, uses specialty water treatment chemicals more intensively than Europe and Japan, especially organic coagulants and flocculants. In Europe and Japan, engineering and technical solutions are preferred when they can be used as a substitute for specialty chemicals. When chemicals are used, the less expensive commodity chemicals—such as alum (aluminum sulfate), ferric sulfate, ferric chloride, and polyaluminum chloride—are typically preferred over organic polymers. In the developed regions, the rate of consumption of specialty chemicals is slowing because emphasis is increasingly placed on minimizing dosing levels and cost reduction. In contrast, the emerging markets, especially China, have the best potential for growth. China’s rapid industrialization and growth of the urban population created an unprecedented increase in demand for clean water. In the past, China only partially addressed the need for better water quality, and industrial growth has only increased water pollution problems, particularly for drinking water; major portions of rural areas still lack access to reliably clean drinking water. Since 2015, the government has increased its emphasis on the need to improve the quality of the water supply. Stricter government regulations on water quality and use will bring opportunities for growth in specialty chemicals for water treatment. Global water management industry growth is dependent on regulatory drivers, industrial development requiring highquality process water, and drinking water improvement projects motivated in part by drinking water scarcity. The first two are important in developing nations, particularly in China. Desalination is becoming more important in some coastal communities in the western United States and in southern Europe. In the Arabian Peninsula and other portions of the Middle East and North Africa, modern life depends on desalination. Wastewater closed loop recycling and wastewater recovery and reuse (ultrafiltration of wastewater for direct use) strategies are increasingly being implemented in the United States and in other developed regions because of increased occurrences of drought and deteriorating quality of water sources. Hydraulic fracking operations to produce oil and gas from shale are significantly more water intensive than conventional oil/gas production. Treatment of produced water (the wastewater generated once the well begins producing hydrocarbons in volume) is of great concern. Companies are investing in new technologies to treat the produced water on-site and recycle it back to fracture more wells. Treatment of produced water will require a combination of mechanical and chemical means, such as flocculants/coagulants and formulated chemicals such as corrosion inhibitors, antiscalants, and biocides. 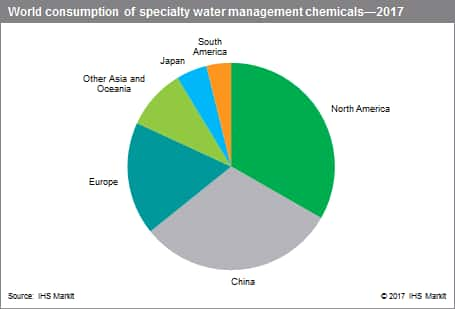 Over the next five years, global consumption of specialty water management chemicals is expected to grow in current dollars (not inflation adjusted) at an average annual rate of about 3.6%.